What are the different kinds of banjos? How much should I spend on a banjo? A custom built Nechville Phantom in Burl Walnut with Burl Walnut peghead. This instrument also includes a gold plated frame, radius rosewood fret board, and custom turquois inlay. FREE EXPRESS SHIPPING! - ORDERS OVER $199 SHIPPED TO THE CONTINENTAL U.S.
Every aspect of a Nechville banjo has been designed for acoustical superiority, convenience, comfort and aesthetics. You’ll benefit from the finely crafted details and artistic approach that goes into all Nechville instruments, and you’ll have plenty of reasons for pride when owning a Phantom. As you take the Nechville Phantom into your grasp you immediately begin sensing a uniqueness in quality. Your left hand slides smoothly and effortlessly over the fancy walnut and cocobolo neck, you feel the comfort and sleekness of the polished frets, and you realize that the silky smooth and streamlined neck on your Phantom is just the beginning of the magic. At first strum, you hear the music and the potentials for taking your music to new heights. There is a remarkable ease in the playability of the tunneled neck on the Nechville Phantom. The 7 to 12″ compound radius of the fret board provides the comfort and playability that produces noting accuracy and clarity of tone. This dynamic neck shape gives you a slim feel with maximum structural integrity for strength of tone. Not only is it easier to form chords and other left hand positions, but you also get clean distinctive and full bodied musical notes. You’ll clearly hear the difference when you notice the total lack of sonic interference that is so often present in other traditional banjos. The Phantom’s slightly wider profile gives you plenty of room for chokes and slides. Extra wide frets form a secure foundation for the strings’ anchor point on the fret board while giving you longer-lasting frets. This combination of features translates to incredible musical power from every note. The Phantom is an example of modern engineering applied to the 5 string banjo. The absence of the 5th peg on the neck makes changing left hand positions easier. The neck is stronger and lends more solidly to the tone. The Radiused neck conforms to the hand with a slim, easy feel that offers comfort and easy playability. The Walnut Phantom with no inlays allows freedom of expression in any key and lets the beauty of Nature’s wood grain patterns to adorn the neck. Made from select black walnut with curly maple binding. The cocobolo fingerboard is beautiful and stable. Our best Megaphonic 40 hole tone ring and Cyclotronic system is standard. We can add these as a free service when you purchase a banjo from us. When you add this banjo to your cart just select that you want the capos. What is this? When you use a standard capo on your banjo fretboard, fretting strings 1 through 4, you’ll need to capo the 5th string separately. The 5th string starts at the 5th fret. If your standard capo is on the 2nd fret, you also need to capo the 5th string two frets higher, at the 7th fret. We recommend installing railroad spike capos on frets 7 and 9 (A and B). We install them on the fretboard just under the 5th string, an idea that was developed and used by Earl Scruggs himself. We use them, and so do most of the professional players we know. When you’re playing, you don’t really notice the spikes because they’re out of the way, but they’re always there when you need them. Simply slide the 5th string under the spike. When you’re done, slide it out. We can send along with your banjo a Starter Pack for free. This includes a strap, DVD, and tuner and picks. 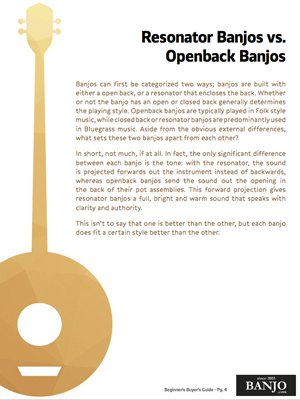 What’s the difference between an openback and resonator? What are the different types of banjos? How much should I spend on my first banjo?